Finely grating the carrots provided colour, moisture, and a hint of texture with much less fuss than carrot puree. As for the other add-ins, I was trying to appease my children, who detest raisins in anything baked. But feel free to use golden raisins in place of the diced apple if you like; dried cherries would be nice too. Orange icing ties everything together once the buns are out of the oven. I love the wonderfully bright and versatile citrus flavour it lends. Much better than candied citrus in my book. If you have any leftover orange icing, it could go onto a batch of Citrus Swirl Lemon Bars or Raspberry Almond Muffins. Dissolve yeast in warm coconut milk or water. Add honey or maple syrup and melted butter (or oil). Stir in salt, followed by flour and spices. Knead until dough is smooth, gradually add small amounts of water if necessary. 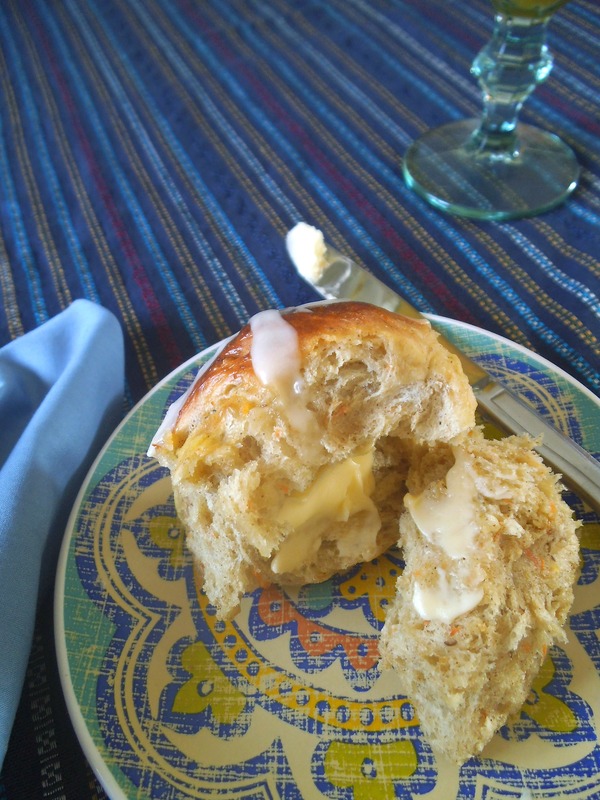 Add grated carrots and walnuts or apples and knead lightly until distributed throughout dough. Place in a large greased bowl. Cover bowl loosely and let rise until double. Punch down dough and divide into 12 equal pieces. Form pieces into round buns and place in a greased baking pan (9×13-inch). Cover loosely with greased plastic wrap or a damp tea towel. Let rise for 40 to 60 minutes. Preheat oven to 400 degrees F (200 C). Uncover dough and brush with egg wash, if using. Bake buns for about 15 minutes or until golden brown. Remove buns from oven and allow to cool in the pan for 10 minutes. Meanwhile, prepare a thick frosting by whisking together orange juice and icing sugar. Use a snipped plastic bag or small spoon to draw crosses on each bun with the icing. (The most efficient way to decorate them is to draw lines across each row in the pan.) If possible serve frosted buns while still warm. These look fantastic!! Thanks so much for sharing them at our Easter party! Pinning. 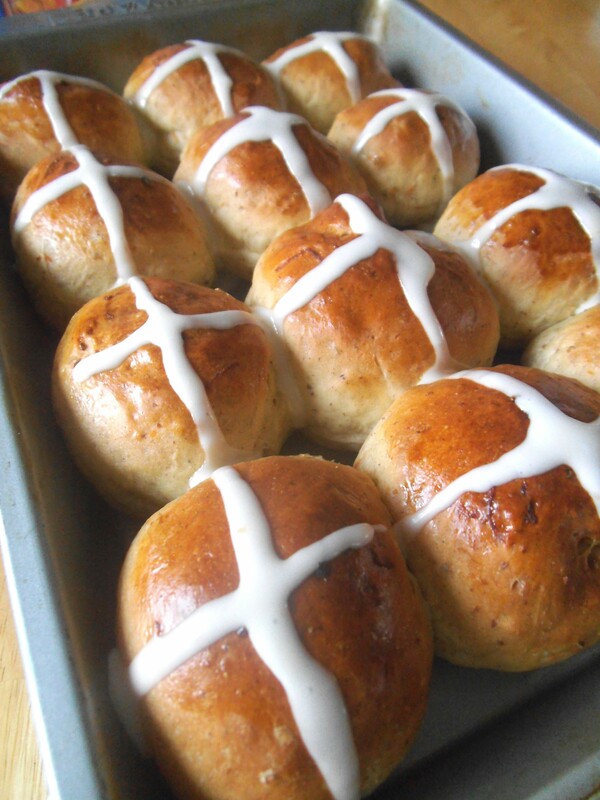 These have to be the most delicious hot cross buns ever! I love the carrot in them! Perfect for spring. Thanks for your vote of confidence! It’s always gratifying when an inkling turns into a success. I hope you get a chance to enjoy them fresh from the oven! Thanks for pinning them! Enjoy! 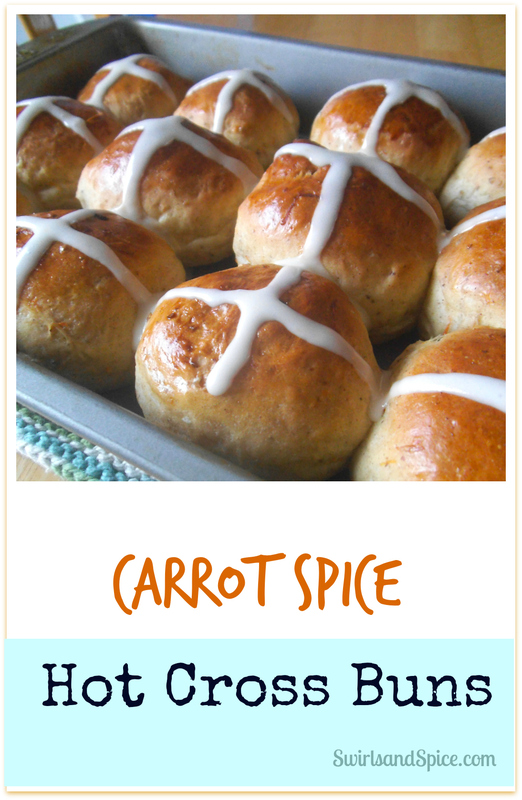 I just learned about the history of hot cross buns… love your carrot spice version. Can you tell us more? Or share a link?